Half-dried bits of grass and leaves landed on my head when I stepped out the front door. There, in the niche, was a nearly completed nest. I got the stepladder and checked---no eggs yet. As I stood on the ladder, a robin landed nearby, beak full of grass trimmings meant for the nest. She remained there, glaring at me while the guilt rose inside me. 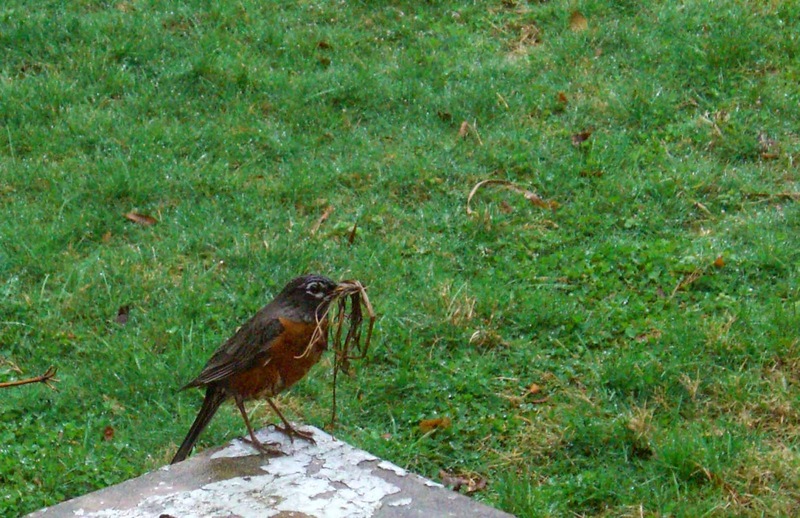 How pleased that robin must have been to locate such a prime piece of real estate sheltered by our porch, where she could build her home while avoiding that day's rain. Sadly, I swept away the nest while she watched. She started two more nests that day. We had to get some bird repellent. I hope that the robin was finally able to safely build her home. Every time I go out in the yard, I wear a hat, knowing that there is one bird who probably has it out for me.